First Stage: Embassy International Ministry Center - A training center for the five fold ministers and those who desire the education of the Spirit. A school of ministry and hands on training for the preparation of the Nations. A place for God's people to be trained, built up, instructed, exhorted, and sent out. 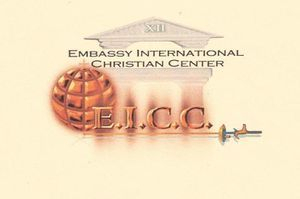 Second Stage: Embassy International Outreach Center- An evangelistc ministry center to train in Evangelism and to prepare the student to do the Ergon ( work of ministry) by ministering to the poor and broken hearted, the bruised and those who are homeless or in dispair. This is a clothing and food Distribution center and also a help to our inner city agencies and state correctional systems, jails, hospitals for God . Third Stage- Embassy International Refuge Center - A place of refuge for God's people to provide for physical and Spiritual needs. This is a refuge center that will encorporate Employment, Jobs, and mainstream technologies by helping those family structures who need a second chance, also housing and board, this facility will house all who are in need of such. Fourth stage: The Embassy- A place for God's people from every nation, kindred and tongue. With many dignitaries that will operate as Ambassadors and will act in behalf of the citizens of the Kingdom of God. These are high officials and Diplomats who will Govern as represenatives of the Most High out of the Posture of Dominion on the Earth and who will hold up their Heavenly Constitution of the Kingdom and their King.